^ Goldstein, Erik (2013-10-11). 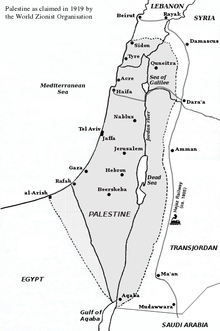 The First World War Peace Settlements, 1919-1925. Routledge. ISBN 9781317883678. ^ Ziolkowski, Theodore (2007). "6: The God That Failed". Modes of Faith: Secular Surrogates for Lost Religious Belief. Accessible Publishing Systems PTY, Ltd (published 2011). p. 231. ISBN 9781459627376. Retrieved 2017-02-19. [...] Ebert persuaded the various councils to set elections for 19 January 1919 (the day following a date symbolic in Prussian history ever since the Kingdom of Prussia was established on 18 January 1701). ^ Meehan, John David (2005). "4: Failure at Geneva". The Dominion and the Rising Sun: Canada Encounters Japan, 1929-41. Vancouver: UBC Press. pp. 76–77. ISBN 9780774811217. Retrieved 2017-02-19. As the first non-European nation to achieve great-power status, Japan took its place alongside the other Big Five at Versailles, even if it was often a silent partner. 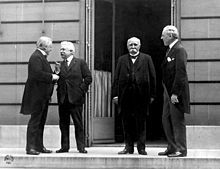 Wikimedia Commons has media related to Paris Peace Conference, 1919. This page was last edited on 9 April 2019, at 16:28 (UTC).